Fortunately for my sanity, I haven’t been keeping a tally of how many times I’ve been asked this question. Unfortunately though, I know it’s a lot. You can’t really fault somebody for asking a question; apparently ‘There’s no such thing as a stupid question.’ While I’d love to debate that, because some questions are just ridiculous, that isn’t what is important here. “What does that work?” A simple, innocent, question, right? Obviously, it’s asked by people who see a specific exercise and want to know why it’s being done. This might be simple for something like a chest fly or bicep curl, where it’s pretty obvious what it does. Ironically though, I’m usually asked for an exercise that doesn’t ‘work’ something specific. They’ll be exercises that provide benefits beyond working a specific muscle. So, in spirit of education, I do my best to respond with something scientific yet understandable; usually it involves a little list of what an exercise does, but sometimes I just go with ‘everything’, which is usually followed with a look this. Sled Dragging. It’s awesome. Seriously awesome. I like to put together conditioning relays with the sled, using between 3 and 5 exercises, and getting in the gymnasium with 3-4 other guys to get it done. There have been a few days when I’ve tried to ‘recruit’ (con/peer pressure) some guys to stepping up to a sled relay, and it’s worked a few times. For the 3-4 guys I’ve gotten on board…I think they’ll be into it for a very long time. Sled dragging is awesome. It’s not just ‘a leg workout’ as one low-IQ’ed young man asked me once. It does many things. Firstly, if you look at the motion; it’s a unilateral leg exercise. Each leg is alternating going into full extension. Perfect. Now, it also taxes your core muscle as you need to stabilize as you move forward. Perfect. 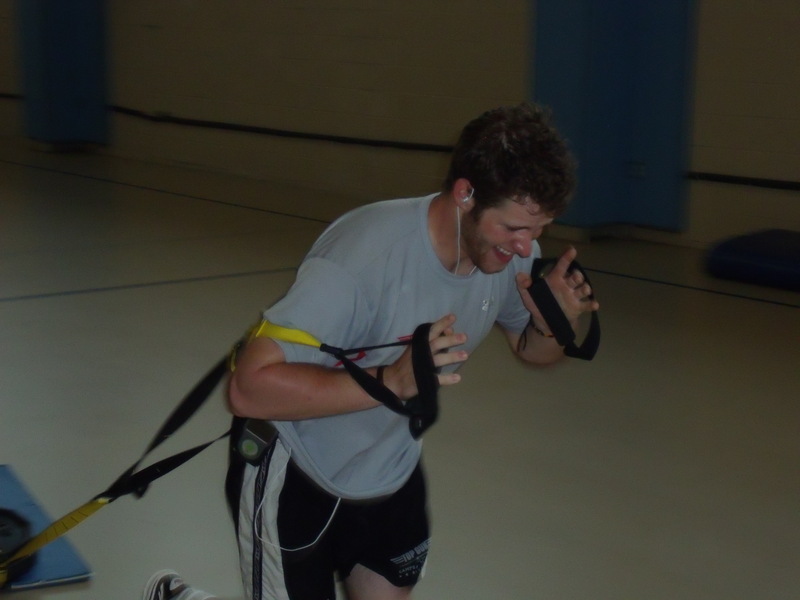 On it’s own, pulling a sled beats you up pretty quick because of the duration of the exercise. Most people feel pretty bad about halfway back. Yours truly Some of them make some interesting faces at the end. As part of a really, the sled drags fire you up so bad that walking lunges and rainbow deadlifts seem like they’re the hardest things in the world. So using sleds are advantageous for both functional strength development as well as developing work capacity. You’re guaranteed to feel it more than anything you’re doing at the moment. I love when kids ask questions. It means that they’re paying attention to what’s going on around them, and that they want to get better. It sure beats the hell out of old men doing bicep curls who give me dirty looks for doing TRX Rear Foot Elevated Split Squats. I’m not mad at kids for asking questions. When the same person asks me three times, that’s when I get a little frustrated. Questioning is good. Wanting to word harder and smarter is good. Asking ‘What does that work?’ is probably the most annoying question I can be asked. But thanks for asking . I think I’m going to change from ‘Everything’ to ‘It works your awesomeness.’ Do you think that sounds more inspirational? Now, on to banish the world of treadmill runners and people doing bicep curls before they attempt chin-ups!